One of the things you quickly realize living in Orlando is that while you might be flying into Orlando headed home, at least half the flight is filled with people headed to Disney World. Excited kids, large international groups, and even the occasional entertainer are not uncommon. All were present on a flight last week as I headed home from business travel. Preparing to leave Dallas, the announcement was made over the intercom that the plane could not pull away from the gate until all electronic devices had been turned off. A minute later, an attendant walked up to the man seated one row behind me and kindly, but firmly, informed the man that the plane was waiting for him to finish his text messages. The man replied that he took off work early to take his family to Disney World and that he was getting slammed with urgent emails. With the same demeanor, the attendant again told the man that the entire plane was waiting on him. He apologized, hit send and powered off his phone. I am always a bit amazed at how oblivious people can be to their surroundings. Airports seem to bring out the worst of this tendency. I (along with the rest of the plane) was pondering this very thing, waiting for Exhibit A to wrap up his business. My heart immediately went out to this kid. I could guess that it was not the first time this kid watched his dad frantically pecking away at his keyboard during family time. But enough about Exhibit A. It was a reminder of how often I see people engrossed in their portal to virtual connection at the expense of actual people around them. I have chuckled silently as every single person in line at Chipotle is sending out texts as fast as they can type. It is common to observe people out to dinner – presumable with each other – engrossed in virtual conversations as they sit quietly across the table. No doubt, I’ve been guilty of this as well. To be clear, I love my iPhone and I am not grumpily clamoring for the good ol’ days when a phone was only a phone and affixed to the wall. But there are times throughout each and every week when the announcement to please turn off electronic devices would serve us well. One of my co-workers this past week was expressing her level of stress, stating that she begins answering texts and emails beginning at 5 am each morning for the East Coast and usually doesn’t stop until about 10 pm wrapping up West Coast correspondence. It is not an uncommon complaint. Perhaps, with the ability to be accessible 24 hours a day, we have lost our discipline to be accessible only to to those physically present – or at times, not at all. Are we taking ourselves too seriously? Maybe my job isn’t that important, but there are times when I definitely choose to be inaccessible. When are the times during your week where you could benefit from the announcement to please turn off electronic devices? Wait, is there an app for that? I read a book a couple months ago titled Grateful by Ryan Sprague. Sprague was a member of the 1999 National Championship football team at Florida State University and the book recounts his journey from walk-on to starting tight end his Senior season. I enjoyed reliving many great memories of that season and Sprague’s insights into being a part of that team. Now Sprague has written a second book, Seasons. Seasons remains in the world of college football, but takes an entirely different perspective on the subject – this time imparting wisdom to the athlete who is about to embark on college life. But this wisdom is communicated in a unique way. 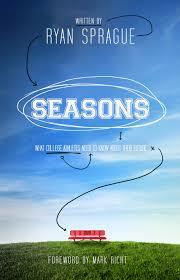 Seasons is the story of a recent high school grad named Justin Foxe. J (which is how everyone knows him in his town) has received a football scholarship to the state university. But before the summer ends and two-a-days begin, his grandfather has planned a day for a number of different people to come spend some time with him, talking about how to prepare himself for life as a student athlete. The advice ranges from dealing with adversity given by a local college coach to faith dispersed from a professor to leadership from a CEO. Other topics include dealing with the media, decision-making, and integrity, among others. The book’s storyline makes for an enjoyable and engaging read. While written specifically for student athletes , the book contains welcome advice for any high school grad advancing to their next phase of life. In fact, being well past my own college days, there is much in the book that served as great reminders for jobs, relationships, and life goals. Seasons has application well-beyond the narrow target audience. For more information on the book and how to order, visit Seasons web site.